Spotify Now adds news, podcasts and videos | What Hi-Fi? Spotify has announced it's adding news bulletins, music videos and podcasts to the Spotify experience, with partners including the BBC, Comedy Central, ESPN and TED. The news follows a similar announcement from Deezer, which has added podcasts, and the star-studded launch of Tidal, which offers music videos and exclusive live concerts alongside its lossless streaming music. At a launch event in New York, Spotify revealed a new 'Now' section of its app, which offers a selection of content, from user-generated playlists, to news bulletins to videos. Spotify announced a number of partners who will be delivering the audio and video content, which include the BBC, Comedy Central, ESPN, MTV, NBC, Slate, TED, TWIT and Vice News. There is also a new Spotify Running mode, which aims not only to serve up music suited to your workout but also adjust the beats-per-minute to fit your running speed, based on information from your smartphone. Spotify is promising playlists and "original compositions" from DJs and artists, with superstar DJ Tiesto taking to the stage for today's launch event. Also new and in a similar vein is Spotify Originals, which promises exclusive tracks and "curated radio shows", with artists including Icona Pop, Jungle and Tyler the Creator involved at launch. Having delivered "over 25 billion listening hours" since it launched seven years ago, Spotify is now aiming to deliver music tailored to your mood and even the time of day. The Spotify Now start page will offer music chosen by Spotify's "in-house experts", with playlists aimed at delivering a pick-me-up arriving in your feed on a Monday morning and party-starting playlists appearing on a Friday evening, for example. 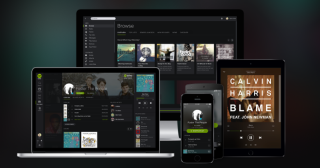 Spotify promises to adapt and update its playlists to your tastes over time. The BBC posted a blog about its part in Spotify Now, saying: "For a year-long period, overseas Spotify users will be able to listen to around 50 speech-only podcasts from BBC stations. "These programmes are already freely available in the UK, so we’re running this trial only for overseas users. This means we can generate income for the BBC to reinvest in programmes for licence fee payers as well as reaching new audiences across the globe." Spotify Now, which brings these new features, will be rolling out on the Spotify iPhone app in the UK, US, Germany and Sweden from today. Spotify says it will come to other platforms and markets "in the near future". Spotify Running is coming to iPhone users globally from today.